I'm not sure if you know this but I'm kinda big deal around here. Yosemite is more than a dot on Rand McNally’s map, it’s not just another microcosm of the climbing universe, and I’m more than a regular climber. Yosemite is the place and I am the man. Every morning I wake in the Valley and run five miles down canyon to the real crags. I climb all twelve of my fixed lines at the Cookie, bust out two thirty sets of fingertip push-ups, and then dive in the Merced and swim upstream to Camp 4. Some say I’m training for the ultimate training day but they’re just jealous because by 9 a.m. I’m back brewing my soy-chai protein infused latte ready to start a day of real climbing. When I climb, I climb the “est”, the steepest, hardest, slabbiest, scariest routes around. Five feet right of Grant’s Crack and three feet left of Oak Flake is my proud new ultra-mega classic first ascent, a super dicey top-rope. It’s named The Falls Trail because I hiked it. The North Face’s athletic coordinator will be making me athlete of the month and my other sponsors will be thrilled. Not entirely sure what I should crush today. I may head to Jailhouse and sport climb, a little multi-pitch bouldering will fluff out my 8a scorecard. My international climbing ranking will jump from 1538th to a solid 1537th. I might take it easy, boulder around Camp 4, and tick that problem on Columbia Boulder. My first time on Midnight Lightning, the world’s most famous boulder problem in the world’s most famous campground, in the world’s most famous climbing destination, was in July during the ranger's Sunday morning coffee session. By my 38th try I was at the move before the move to the lightning bolt. Everyone was watching me, as they should be. They shook their heads. They must have been amazed by my chiseled physique and unbelievable talent. Even though Midnight Lightning is hard (V9), it’ll be easy for me. I've been bouldering double digits since I started (I count V as a digit). With my rippled six pack and enormous guns, I’ve got the postage; I just need to send it. If I don’t get it today I’ll eat broccoli for three days, drink Diet Coke for two, and not change my underwear for a week; that’ll make me send. If the pebble wrestling doesn’t go too well, I’ll sort my brand new wall rack in the parking lot in front of everyone. El Capitan is my second home. I climb up to 5.14 on El Cap; I climb up to it and aid through it. When I’m not busy freeing old aid lines, I send hard wall nail-ups. The monkeys send El Cap super duper fast, no more six month siege feasts of working routes into submission. Alex and Thomas Huber, maybe you’ve heard of them they’re famous, they sped up the Nose in under Three Hours. I’m just like them. The license plate on my Toyota Tacoma reads NO BIVY. Last week I made a 138 hour continuous ascent of the East Buttress. Next week I’m going to shave my time down to sub-five days. I may have to leave the ditch and go get strong somewhere else. I'm not just a Valley rat. When summertime rolls around Joshua Tree is prime, 112 degrees in the shade. My best climbs have been in the desert heat. I almost free soloed- that means no rope- North Overhang. I was cranking the fourth class top out a hundred feet off the deck; it was no mistake or flat pancake. I got the batter. I cratered hard but after I walked off my broken back, I fired it. Joshua Tree has more than 100’ boulder problems. I went to an overhanging slab route called Thin Red Line and managed to onsight it, second try with two falls and one point of aid. The technical moves were difficult. The protection was sparse at best, think hard moves twenty six inches out from ½” expansion bolts, still I campused the 70 degree crux. Who needs feet on slabs? Technique is for the weak. The water for my soy-chai protein infused latte is done boiling in my brand new North Face Gore-tex high octane gasoline stove. I’m gonna enjoy climbing here in the center of the Universe because climbing in Yosemite means the world revolves around me. Don’t worry; it won’t go to my head. I’ll still be California’s humblest man. So enough about me. Let's talk about you. What do you think about me? Do you have a sister, is what I'm thinking? You ARE the humblest around, no question. El Capitan is my second home. I climb up to 5.14 on El Cap; I climb up to it and aid through it. Now THAT'S funny! Mind if I steal that line? Nice. I look forward to a book about your humble excursions. Too funny James! You are with out a doubt the raddest of the rad in the valley. Don't take any crap from those Huber boys, you are quite obviously better than them! Can't wait to read the "Yosemite Softman" version. Sort of interesting to see that your mishap on North Overhang hasn't dented your... shall we say, prowess for stating your abilities, for better lack of saying it. ;-) Heh heh. 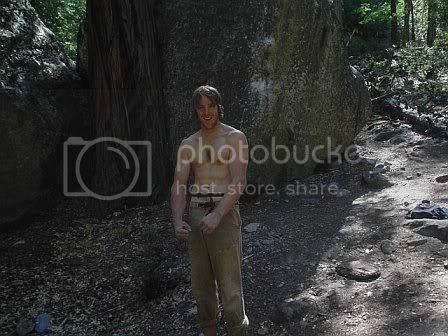 Dork posted that at Rockclimbing.com, too. Yes, I lurked there today. What of it? Edit: I posted first and read second. Isn't "No Bivis" Hans's plate? Yea, but can you belay 5.13D? Yes, I too was pleased to see the Notes posted on the board in C4. Well done James, you also have the spray-est covered.